Every pet cat sees himself or herself as a household tiger, prowling around their neighbourhood in search of wild adventures. Many cat owners can relate to their beloved feline companion excitably clambering up a tree in pursuit of a pesky bird, only to find themselves stranded on the tippity-top branch. Suddenly their jungle fantasy implodes and they are simply a timid little kitty again, miaowing for help and missing the comfort of their human’s strokes. And it would seem this paw-ful predicament also extends to their bigger, toothier cousins, who can also find themselves tree bound and freaked out. 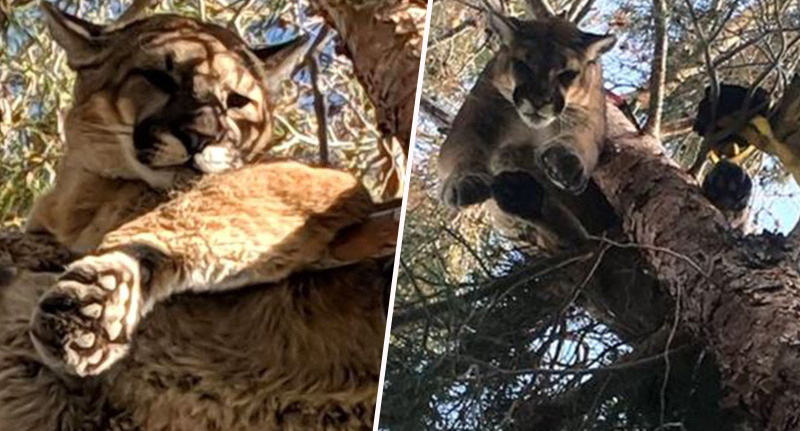 Firefighters in California have rescued a young mountain lion, who was spotted resting on a branch of a tree, approximately 50ft (15m) above the ground, just outside a private residence on February 16. The big lad was spotted by the owner of the property while they were out working in their garden. I can only imagine how many freshly filled plant pots were smashed as they rushed to call emergency services. A fire engine crew arrived at the property approximately seven minutes later, and the surrounding area was secured to ensure public safety. Of course, this was no normal ‘cat up a tree’ scenario, and a careful strategy had to be implemented. At around 4:20pm, the lion was tranquillised and plucky firefighters were able to approach him through the use of a ladder. The firefighters secured the tranquillised lion in a harness, and – in what was no doubt a nail-biting exercise in keeping your nerve – were able to lower him to the ground. Here, the beautiful creature was checked over biologists to make sure everything was okay.